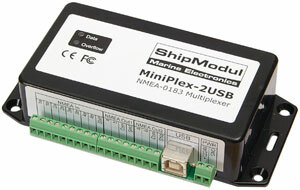 The MiniPlex-3USB is an advanced NMEA multiplexer, combining data from up to four navigation instruments into two NMEA outputs and a USB port. 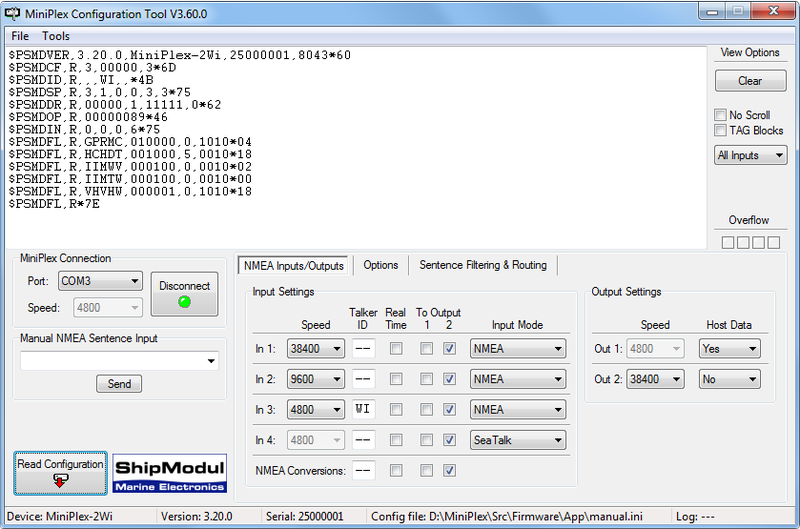 It also supports AIS and other high speed NMEA devices up to 57600 Baud. • All inputs are galvanically isolated, eliminating ground loops between instruments. • Full galvanic isolation on the USB port, eliminating ground loops between multiplexer and computer which are often on separate power grids. • The MiniPlex allows you to fully control the source, the destination and the rate of each individual NMEA sentence by its powerful sentence filtering and routing facility. • Automatic switching between computer navigation and GPS based navigation. • Automatic switching between primary and secondary instruments in case of failure or invalid data. • Connects directly to a USB port without the typical USB problems. Plug & Play as it was meant to be. The MiniPlex-2USB can be connected directly to the USB port of the computer without an additional Serial <-> USB converter. The supplied driver creates a virtual COM port on the computer, allowing all existing navigation software to be used with this multiplexer. Stand-alone operation is also possible, in which case the USB interface is only used to configure the multiplexer. The combination of the MiniPlex-2USB and its virtual COM port driver is a dedicated NMEA solution, as opposed to using a generic Serial <–> USB converter. It therefore does not exhibit the well known problems of these generic converters like false detection of mice when the GPS is switched on or sudden drop-outs in the NMEA data stream. Any attempt of Windows to detect Plug & Play devices on our virtual COM port is blocked. The result is that the MiniPlex–2USB is a real trouble-free Plug & Play solution. Just plug in the USB cable, insert the driver CD, a few clicks and you're up and running! A MiniPlex with firmware version 3.00 and higher can be updated. From time to time we will develop new features for the MiniPlex and make updated firmware files available in the Download section.